aimo is free-floating car sharing service at its best. 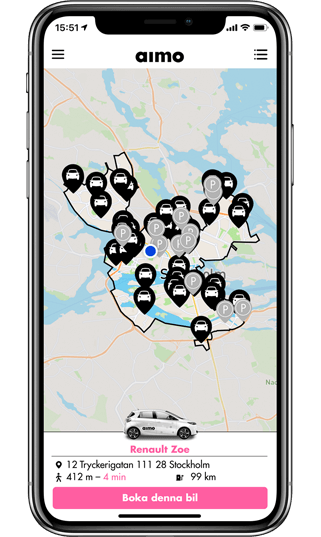 Open the app, pick up a car near you, keep it for as long as you want and end your trip by parking in any approved spot within the Homezone or at a Hotspot. You only pay for the time you use. No parking fee, no toll fee, no fuel or charging fee. It's an easy and affordable way to get you from here to there. Aimo cars are located all around the city within the Homezone and at dedicated hotspots. You can find available cars by using the aimo App. Cars can be booked 15 minutes in advance, or you can simply walk up to an available aimo and start your trip. You start your trip through the aimo App and then you can drive anywhere, and keep aimo for up to 48 hours per trip, as long as you end your trip in the Homezone or at a Hotspot. You only pay for what you use, and are charged a low per minute, per hour or per day rate. If you want to make a stop during your trip but want to keep your aimo, whether inside or outside of the Home Zone, you can make a stopover by pressing the pause button in the app to lock the car. In a stopover, trip time keeps accumulating, but you know your aimo will be there when you get back. To end your trip, just park in any approved parking location within the Homezone or at a Hotspot and press "End trip" in the app. You pay for the aimo service from the time you open the doors in the aimo App until you end the trip in the aimo App and the doors are locked. What is the Home Zone? Our operation area is called the “Homezone” and covers a marked area in Stockholm city. This is where you can find the car, start and end your trip. You can view the Homezone in your app. A Hotspot is a parking with specific places reserved for aimo. Here you can pick-up or drop off your aimo. In the app you can click on a Hotspot and then "Show description" to get information on how many free spots or available vehicles there are. Please note! If you are leaving a car and do not find a vacant spot in our reserved spots, you must unfortunately park your aimo in another location. If you park the car in a place that is not reserved for aimo in a Hotspot, there is the risk of fines that you are required to pay. It is free of charge to become a member, you simply pay for your trips! For the current fees for using (and misusing) the service please refer to the Price List on the website. Please go to the login page in the app and click the “forgot password” link and follow the instructions. How do I unlock a car? You can unlock your aimo that you've reserved or any available aimo on the street or at a hotspot using your aimo App. How do I start the car and where is the key? You don't need a key to start your trip. Just put your foot on the brake and push the 'start/stop' button. Because it's an electric car you won't hear the engine start, instead you will hear a small signal informing you the car is ready to go. What if I want to make a stopover with the car without ending my trip? You can easily park and leave your aimo after pressing the “pause trip” function in the aimo App. Please note that you continue to pay until you have ended the trip in the aimo App. Can I drive outside of the Home Zone? Absolutely yes! You can drive outside of the Homezone, but you cannot end your trip before you return to the Homezone. As soon as you drive outside of the Homezone the car will inform you - via the voice system - and the light near the glove box will change from green to red. When you are returning to the Homezone the light will turn green again. What is the range of a fully charged aimo? Your aimo is a Renault Zoe, a 100 % electric, smart city car. It has an average range between 200 km 300 km depending on the weather. The range will be affected above 90 km/h. We will make sure that the aimo is charged as soon as the capacity is below 20 km. If the battery goes below this limit during your trip you can continue driving to your destination, if the battery allows. There is also a charging cable available in the car that will allow you to charge at no cost to you on any Type 2 (EU standard) charging spot. However, please note that if you return the car with less than 15 km of range it will trigger a fee according to the Price List and if the car reaches 0% it will have to be towed. In that case you will also be charged a towing fee according to the Price List. The remaining range can be read on the dash board. What do I do if there is very little power left on the battery? We will make sure that the aimo is charged as soon as the range is low. If the battery goes below 15 km of range left during your trip you can continue driving to your destination, if the battery allows. There is also a charging cable available in the car that will allow you to charge at no cost to you on any Type 2 (EU standard) charging spot. However, please note that if you return the car with less than 15 km of range it will trigger a fee according to the Price List and if the car reaches 0% it will have to be towed. In that case you will also be charged a towing fee according to the Price List. The remaining range can be read on the dash board. How do I charge a car at a charging station? How do I disconnect the car from the charging station? You can disconnect the cable from the car by pressing the switch located on the dashboard at the left side of the car’s steering wheel. To relaease the charging cable from the charging point simply pull firmly. Inside our Homezone you can park for free and end your trip on street almost everywhere where you can park for 24hrs. Good to know that there are differences between parking in Stockholm, Solna and Sundbyberg area. Read here where it is OK to park in each area and do not hesitate to contact us if something is still unclear. If there are damages to the car before I start the trip, what do I do? If you notice damages to the car before you start your trip, please notify customer service on tel: 010 456 39 39. If you are involved in an accident, please take a photograph of the damage and immediately give us a call on the number stated above. Our cars are insured; however, please note that there is a deductible (Sw. vagnskadegaranti) that you might be liable to pay. If you are involved in an accident with another driver please be diligent to document the damage together with the other driver, in this case you might also be liable for an additional deductible (Sw. trafikförsäkring). The amount of the deductible is available through the Price List. Is it possible to bring my kids? Yes! The cars are equipped with ISOFIX fittings on outer rear seats and front passenger seat if you want to bring a childseat. Is food allowed in the aimo? Yes, but please clean up after yourself. Excess cleaning fees will be charged according to the Price List if a car is returned dirty. Can I bring pets in the aimo? All aimo cars are pet free. Unfortunately, you cannot bring pets in the car out of consideration for other car users. If you chose to bring a pet in the car anyway, you will be charged an additional fee according to the Price List. Is smoking allowed in the aimo? Smoking is not allowed in the cars due to safety issues and in consideration of other users. If you chose to smoke in the car anyway, you will be charged an additional fee according to the Price List. What if I have lost or found an item in an aimo? If you find an item left behind please leave the item in the glove box or the trunk depending on the size of the item and let us know by contacting our customer service. Please also give us a call to report a lost item, we will keep an eye out for it and let you know once it has been found. We keep all lost and found items at our office for 30 days. You can give us a call or email us to identify your lost item. And while we will do our best to keep your belongings safe, we are not responsible for any items that are lost or stolen in our cars. There are no maps in the car. We are working hard to offer you a wide selection of maps so that you can navigate easily with your aimo. Meanwhile we recommend that you use the navigation on your mobile. Thank you for your patience. If the app freezes, we recommend that you restart it. If you need further assistance, please contact customer service. When your aimo is in sleeping mode, it might take up to one minute before it responds. If it takes longer we recommend that you reinitiate the app. Thank you for your patience. Booking is free, you pay from the time you open the doors until you have closed them again (and ended your trip). When you create an account, you will enter your credit card details. Once you have completed a trip aimo will automatically withdraw the amount from your card. You will receive a summary of your trip by email and a complete invoice (with VAT details) is available through the aimo App.